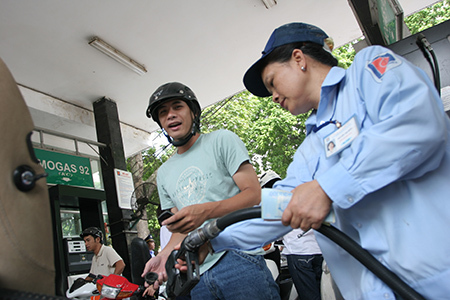 The Ministry of Finance and the Ministry of Industry and Trade have allowed wholesale companies to increase their fuel prices by VND426 per litre started June 14. To decrease the gap between world and domestic price, the companies are compensated VND300 per litre from the price stabilisation fund while increasing retail fuel prices by VND426 per litre. The price of diesel increased by VND221 per litre. Meanwhile, the ministries provide compensation of VND300 per litre for kerosene and VND100 per kg for mazut, whose prices will remain stable. Explaining the decision upset and confused consumers, the Ministry of Finance said that since May world fuel prices have been on the rise, with the price for gasoline RON92 stand at USD112.6 per barrel, diesel at USD117.24 per barrel, and kerosene at USD115.43 per barrel and mazut at USD610 per tonne. In order to stabilise fuel prices, the Ministry of Finance and the Ministry of Industry and Trade lowered import duty by 1% on May 18. And beginning in June fuel companies have been compensated from VND160 to the maximum of VND400 from the stabilisation fund. However, due to the volatility of the world prices, the companies still experienced losses. In addition, the stabilisation fund is exhausted and the import tax is insufficient to make up the difference.